The second offering in Scott Taylor’s Into the Light series, this album is designed to give you a sense of one aspect of a near-death experience—meeting your guides.. 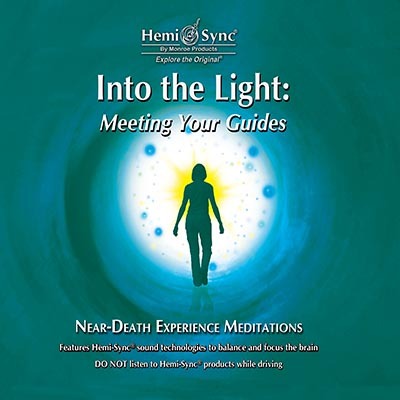 Into the Light: Meeting Your Guides offers opportunities for exploration of a near-death experience as previously introduced in the popular Into the Light with Hemi-Sync®. Scott Taylor has designed two new exercises to give you a sense of one aspect of an NDE—meeting your guides. The first exercise is a fully-guided exploration of how to prepare your body, mind, and energy body to make exploration possible, meet and converse with your guides, and learn the skill of bi-location—one of the forms of an out-of-body experience that is easy to learn and very helpful when exploring the nonphysical universe. The second exercise allows you more time to explore this expanded state of awareness. Detailed guidance manual included. Music by Christopher Lloyd Clarke. Visit Scott’s website at www.neardeathmeditations.com for more information on near-death experiences.